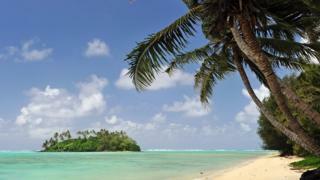 The Cook Islands in the South Pacific is considering a name change to reflect its Polynesian heritage. The nation was named after British explorer James Cook who landed on the islands in the 1700s. A committee is considering 60 options in Cook Islands Maori including Rangiaroa, meaning Love from the Heavens and Raroatua which translates as We Stand Under God. A referendum was held in 1994, when voters opted against a name change. The committee's chairman, Danny Mataroa, told Agence France-Presse: "When the committee members, which include Cook Islands historians and people with deep traditional knowledge, met we decided it was time we change the name of the country." He added that the updated name should reflect the country's history, its religious beliefs and its people. The plan has support from Deputy Prime Minister Mark Brown, who told Radio New Zealand that he was "happy to look at a traditional name". However, the name-change may take a while. Mr Mataroa told Reuters there would probably have to be a new referendum and the process could take two years. A former British protectorate, the islands came under New Zealand's jurisdiction until becoming a self-governing nation in 1965. It remains in free association with New Zealand, which retains responsibility for foreign and defence affairs, in consultation with the Cook Islands' government.